What’s in a name? Quite a bit actually. The names you give to your OmniFocus projects and single action lists can have a major impact on your productivity. Project names that are vague and uninspired can make your system (and your life) feel drab and boring. Conversely, thoughtfully-named projects and single action lists visibly spring to life and encourage action. In this article we’ll look at some best practices for naming projects and single action lists, drawing some wisdom from David Allen’s Getting Things Done (GTD) approach. We'll also look at how consistent naming conventions can help you quickly locate related projects and how emojis can be used to add some visual flair. It’s important to understand the difference between a project (as defined in GTD) and a single action list. David Allen describes a project as a defined outcome that requires at least two discrete actions to complete. For example, “Plan Trip to Vancouver” is a project as it has a defined outcome (i.e. planning for a trip to Vancouver is complete) and requires multiple actions (e.g. research airfare, book flight, phone travelling companion). In GTD parlance, one-off actions that aren’t tied to a specific outcome are considered next actions. For example, phoning the garage to make an appointment to book an oil change would likely be the next action, assuming you know where to take the car for service. If you didn’t, a project such as “Find new garage” may be in order. 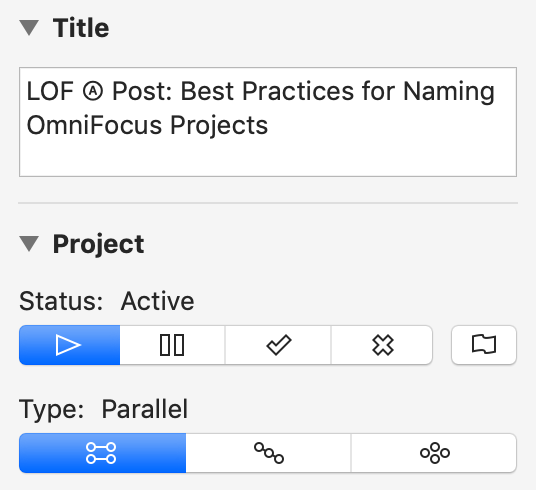 OmniFocus supports three types of projects: parallel, sequential and single actions. OmniFocus projects that are parallel or sequential are GTD projects. They’re intended to be used for working towards defined outcomes and are consider “stalled” if they don’t contain any actions. OmniFocus projects with the type set to “single actions” are used to group related items and can be empty. In this article, I’ll refer to parallel and sequential OmniFocus projects as “projects” (i.e. GTD projects) and OmniFocus projects with a type of "single actions" as “single action lists” (i.e. GTD next action lists). As mentioned previously, single action lists can be used to store lists of related actions. For example, you might have a single action list called “Car Maintenance” that houses all of the one-off actions that are related to taking care of your car. Generally speaking, I recommend that Single Actions Lists be named according to the area of your life or work that they represent. These lists typically exist for as long as you’re responsible for, or focused on this area of life. [Health] — For single actions related to health (e.g. "Phone: Dr. Brown to book appointment for annual physical"). [Friends & Family] — For single actions related to friends and family (e.g. "Phone: Mom to ask what to bring to Sunday dinner"). [Admin - Business] — For single actions related to business administration (e.g. "Buy office supplies at Staples"). [Squamish Realty] — For single actions related to one of your client accounts (e.g. "Email: Maria with a quarterly update on website performance"). When a folder contains both projects and single action lists, I recommend grouping single actions lists at the top and placing projects at the bottom. Projects will come and go, whereas single action lists will likely be around indefinitely. On a side note, you’ll probably want some of the actions in your single actions lists to repeat automatically. For example, if you have an action of “Water plants” in your “[Houshold]” single action list, it would probably make sense to configure it to repeat every one week based on this action's completion. This way you won't have to keep recreating this action manually and this important responsibility is less likely to be forgotten. Your plants will thank you.